Review: 2013-12-07, nice exchanges from the first bell and two knockdowns: Darren Barker vs Felix Sturm geys three stars (the referee gets one). Darren Barker (26-1-0, 16 KOs) entered as the No.4 middleweight in the world while Felix Sturm (38-3-2, 17 KOs) entered as the No.5 (currently the #1 in this weight division is Sergio ‘Maravilla’ Martinez). 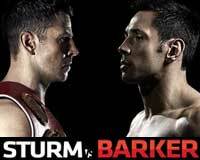 Barker vs Sturm is valid for the IBF middleweight title (Barker’s first defense). Watch the video!